This smart wireless monitor has many functions to help you stay healthy. It will lift the lifestyle of people with increased health risks caused by diabetes, excess weight, high blood pressure, heart strokes, etc.. It supports BT 4.0LE connection to show your health data on the phones, it is for Android 4.4 and above, for IOS 8.0 and above. So it fits most smartphones. 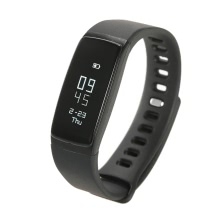 BT 4.0LE WIRELESS TECHNOLOGY: Track and record your health data such as steps, sleep, heart rate and blood pressure real-timely and transmit live, accurate data to your smartphone. PROVIDE ACCURATE DATA: The data provided include pedometer, distance, calories modes, monitors blood pressure, heart rate, and sleep, and notifies incoming calls and messages. COMFORTABLE WEARING: Soft TPU strap wrapped around your wrist, then enjoy you life with an innovative and easy-to-wear design. EASY OPERATION: Interchange the two UI display methods-horizontal and vertical display by long pressing the touch area for 5s in display mode. Long press for 6s in sleep mode to restore to the default state with vibration indicated. Long press for 5s to turn off in turn-off state. EASY PAIRING WITH PHONES: Before connecting, please make sure the BT on your phone is turned on and then press touch area on the wristband for 6s to turn on it(vibration indicated), then refresh the “H Band” APP list to scan the “V07” device, select the name to connect.